I wasn’t thinking about it as I drove north to a new life in a new city. Until this point, where I wanted to belong had been very clear: with my family and my peers. These were the hands I fought to hold onto figuratively and literally, even if it was painful. Where I didn’t want to belong was also very clear: with other people with disabilities. When I read this quote in the late 1980s, it made perfect sense to me. Ambivalence. Total ambivalence about this thing in my life, arthritis, that doctors had only ever talked about negatively and that I had only experienced as a negative force. I’d lost movement, I’d lost independence and I’d lost connection to many of the normal experiences of my peers. All without giving me anything positive in return. I wasn’t interested in belonging to a group founded on deficiencies. At that time, the term disabled was in common use and there was growing awareness that using crippled or handicapped wasn’t acceptable—even if there was no understanding why. 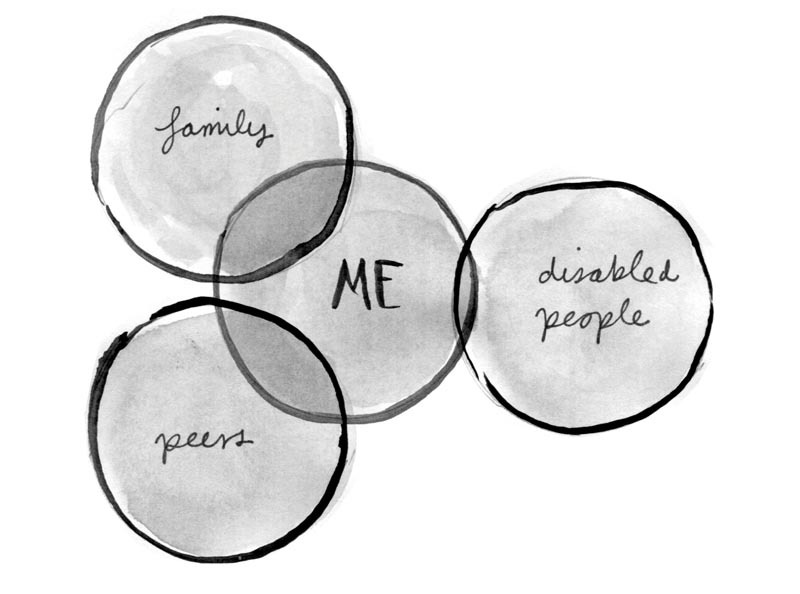 The new phrase, ‘person with a disability’, was one I sometimes used in connection to myself, but it was a precarious relationship. Disability felt like an iron curtain: if I got too close, I’d never come out. Still, I liked the theory of it—that I was a person first, and my disability was only part of me. Of course that wasn’t completely true. Saying it was only part of me made it sound like it was a side salad, an optional extra. In reality, it shaped much of my day and my life. After a year in Palmerston North, I moved into a flat. Unlike my flatmates, I couldn’t physically do my own washing. Every couple of weeks, I’d stuff my sheets and clothes into a couple of plastic bags, drag them to the car when no one was around, and take them to a Laundromat. There, all I had to do was take the bags in and the staff did the rest. I didn’t want my flatmates to know any of this. I didn’t want them to see that I couldn’t do my own washing—as if, bizarrely, they hadn’t already noticed! I was so used to battling necessary wars, I fought unnecessary wars as well. Ironically, a non-disabled flatmate was instrumental in helping me come out of the laundry closet. She had just begun working for the Crippled Children Society2 and invited me onto a support group for a project considering the health-related needs and experiences of women with disabilities. Around a table strewn with research findings and Chinese takeaways, we began to talk about our experiences of living in a different body. As one person explained how it felt to be on the medical conveyor belt, the rest of us nodded, cheered, cried. … When I moved to Palmerston North in my twenties, joining a project group with other disabled women helped me identify as having a disability in a positive way. Previously, as long as disability was associated with weakness rather than strength, oddness rather than diversity, insignificance rather than value, it was a club I didn’t want membership of. What I found slowly, as I moved into adulthood, was not necessarily a place or a club, nor one organisation or disability group, but connections with people who understood my experience from the inside out. That has continued. Sometimes the connections are small: a conversation, the sharing of a story, the attending of a meeting, the signing of a petition. Other times they’re significant and lasting: an idea that grows to a project, which leads to commitment, builds to political action and results in change. Together we fit under that wide, sometimes tatty, umbrella called disability. I gravitate towards it more often now than I ever did as a child or teenager. I find strength and humour under it and another place to belong. This is an extract from a 2140 word essay in a memoir by Trish Harris called The Walking Stick Tree, published by Escalator Press and available for purchase in all good bookshops and online at the Escalator Press website. Original generation time 3.9595 seconds. Original generation time 1.4829 seconds. Cache Loaded in: 0.0006 seconds.